It is truly amazing how quickly our landscape can change in the space of one century. 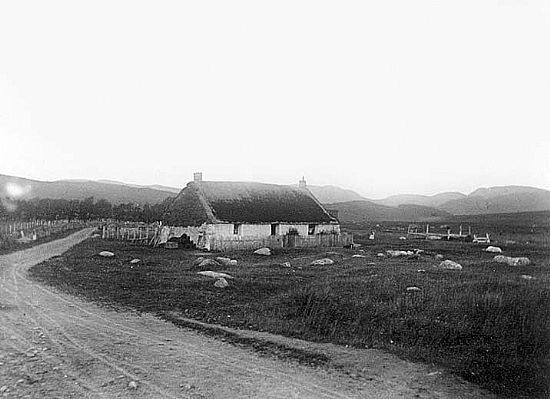 The late 19th century scene shown here is located at the corner at Dumaglass Mains road end, at the head of Strathnairn, where the public road turns sharply west towards the "Culan Odhar" (the boundary between Strathnairn and Stratherrick - once the border between the mighty Clans MacGillivray and Fraser). The road layout today is exactly the same as shown in the picture but the scenery is radically different. The modern view is one of a solid conifer plantation - gone is the spectacular view of the hills above Loch Ness which we see here in the distance. Only the diligent searcher will find any remaining trace of the house and garden where the little child (visible in the picture) once lived and played. In place of people and families we now have trees. Is this progress? Note the turf gable on the house. There were many different designs of black houses throughout the Highlands and Islands but the turf gable appears to be peculiar to this area. Some remaining ruins still retain part of their turf gable, suggesting the durability of this type of construction.